How can you have a fan interfernce call if the ball is in the stands? You can’t. The rule says the fielder goes into the stands at his own risk. Unfortunately there wasn’t a good angle that showed if the fans reached over the line or not. It was too close to call so the ruling on the field was upheld. If West has signaled HR that probably would have been upheld also. Tough break for the Astros. Big Frank in the Hall? "No doubt about it." Only "Cowboy" Joe West. LOL. August 14, 1983 - Catcher Carlton Fisk appeared to hit a go ahead home run in the fifth inning off the Orioles Scott McGregor only to have home plate umpire Jim Evans overrule third base umpire Greg Kosc and say it was a ground rule double. The decision was based on the impression that a fan appeared to have leaned over the wall to catch it. The Sox wound up losing 2-1. That fan then called Jimmy Piersall’s radio show afterwards to give his side of the story. TV replays showed he was not leaning over the wall when he caught the ball. Manager Tony LaRussa went ballistic…arguing, kicking dirt, then taking the third base bag out of its position and flinging it towards the Sox dugout. Naturally he was thrown out for it. Just another in a series of bizarre plays that took place against Baltimore down through the years. Last edited by Lip Man 1; 10-18-2018 at 11:27 AM. I don't think Joe West did anything wrong. It's a very close call to see where the ball was when the fan clearly hit Betts glove. It was one of those calls that wouldn't get overturned by replay review either way it was called because it was so close and there was no difinitive angle. The ball was in the seats from what I saw, therefore the fan had every right to go after it because it was technically outside the field of play. The onus is on the outfielder to make the catch regardless in that situation. The fan didn't appear to be leaning over in the field of play, that's the difference. But again only Joe West, the guy the last week of the season stopped play and called out a dugout cameraman for Fox Sports Arizona for having the camera just over the railing. 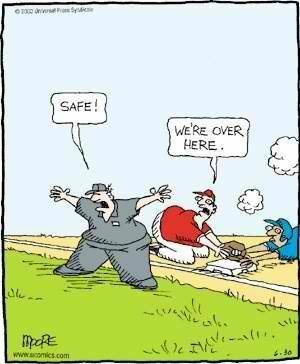 Bob Brenley had a classic put down line, (paraphrasing) "West can see a camera six inches over the line but can't call balls and strikes correctly." Rule #1: Catch the ball. Rule #2: Don't mess with Joe West. That's your point of view, much disagreement among many sports people whether the glove was in the stands. The only proof would have been the side view camera which was blocked by a security guard. If West made the call, it was wrong. Red Sox are in the Series. Our long national nightmare of not having the Red Sox or Yankees in the Series for 5 whole years is over! No doubt champagne was flowing at ESPN headquarters last night. Time for Ken Burns to crank out another Extra Inning of his Baseball series. ....and yes, I realize that the Dodgers are also a big market/big payroll team. Very depressing to see Benintendi become a star, even though the rumor mills say the White Sox never had a shot at getting him for Sale. Dombrowski supposedly gave Hahn two packages to choose from and the speculation was that either Benintendi or Devers was the headliner in it along with lesser prospects. The other package was Moncada and Kopech. We've got a game 7 tomorrow night in Milwaukee! What a beautiful thing. Let's go Milwaukee!